Parties are fun but they provide an increased chance of spills. Kids are a blessing but they typically raise the chances for a spilled drink here and there and just life in general creates spills. It is best to get to a spill as soon as possible and remove it. The problem is you can never find a towel when you need it. So here is the trick. Find some old towels and put them under your sofa seat cushions and chair seat cushions. If you fold them neatly, no one will know they are there and then, when the spill happens, a towel is nearby ready for use. 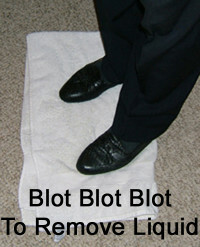 Just reach under the nearest seat cushion, pull the towel out and stand on it to blot up and remove the spill. Periodically move the towel so a non-wet portion of it is on the spill. Keep this up until you do not see liquid transferring to the towel.